Animal welfare campaigners have released new footage showing pigs and piglets being mistreated on Dutch factory farms. 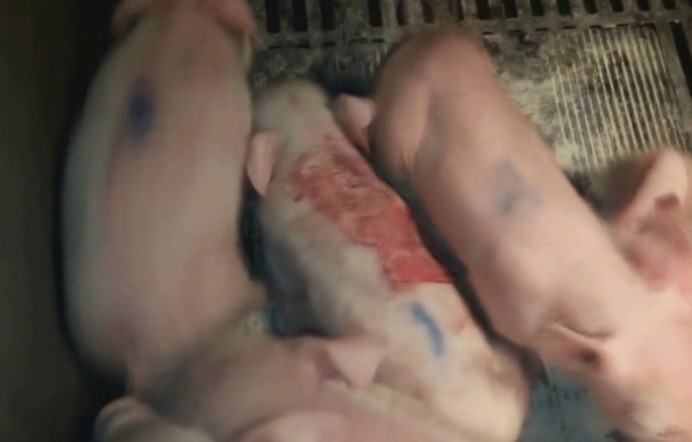 The footage, taken by an uncover member of Animal Rights using a hidden camera, shows piglets being tossed into crates and screaming as their tails are cut off without anaesthetic. The footage also shows pigs being kicked and sick and injured animals. The incidents took place on factory farms in Lunteren in Gelderland and Nuenen in Noord-Brabant, where much of the Dutch pig industry is concentrated. Food industry inspectors said in June they had handed out 48 fines at 19 different slaughterhouses in the Netherlands because of the way pigs were being treated. That report led MPs to call for the naming and shaming of offenders. The NVWA has not yet commented on the new claims, nor has the pig breeders association POV. There are some 3,500 pig farms in the Netherlands with a total of over 12 million pigs at any one time.